Your journey towards a healthier life and slimmer waistline begins here and now! Are you tired of filling your body with chemicals every time you eat processed foods? Is it time to lose weight, get healthy, and give your family the best possible nutrition? The Mediterranean dietâ€”ranked #2 in Best Diets overall, it is high in vegetables, fruits, olive oil, and whole grains, and moderate in protein and animal fatsâ€”has proven to be beneficial in reducing the risk for diabetes, heart disease, and stroke. Now, a new study shows it may also be good for the brain. The Mediterranean diet isn't just a fad or a quick fixâ€”it's a healthy lifestyle choice that's here to stay! For many of us, the idea of dieting conveys unpleasant notions of flavorless piles of lettuce and overpriced freezer meals. 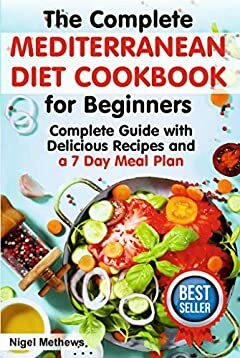 But the secret to losing weight isnâ€™t starving yourself or eating processed â€œdiet food.â€ With The Complete Mediterranean Diet Cookbook for Beginners youâ€™ll begin dropping pounds immediatelyâ€”and learn how to keep them off for goodâ€”by following this healthy diet packed with tasty, wholesome meals that youâ€™ll love. Mediterranean DietÂ is useful for people wishing to lose weight as it is rich in fruit and vegetables and lower in sugars and saturated fats than a typical Western diet. It can reduce the risk of a premature death and increase the chance of a healthy retirement, free from long-term medication. Grab your copy of Mediterranean Diet for Beginners right away! Just scroll up and select the â€œBuy now with 1-Clickâ€ Button â€“ Itâ€™s quick and easy! The Mediterranean Diet Cookbook for Beginners is A Complete Guide with Delicious Recipes and a 7 Day Meal Plan!